On the edge and living dangerously, the crew in this photo are, to their credit, still racing hard and just about in control, managing to hold off a crash gybe. It appears that they have either just gybed or, for some other reason, the spinnaker guy has come out of the spinnaker pole and they are on the bow wrestling to get it back in the pole end. When the spinnaker is being flown by the sheets with no pole attached it can swing about and cause the boat to roll. The helmsman now needs to sail low to help keep the spinnaker flying and a little windward heel is also a good thing, but taking it too far can lead to a Chinese gybe. In conditions such as these you must do this with extreme caution. The main problem here appears to be the fore and aft trim – for example, how bow-down the boat is because there are three people on the bow. If the bow starts to bury, the rudder becomes less effective and the bow can also steer the boat one way or another. With the bow hard in, the more you heel to windward, the more the boat will try to bear away, increasing the load on the helm and the chance of a Chinese gybe. Try not to sail too low and keep all the weight as far back as you can (crew weight and weight below decks). Keep the spinnaker tight to the boat, pull the vang on quite hard and be ready to trim on the mainsail the moment the boat starts to heel too much to windward. One person should be calling the gusts to the helmsman, especially if they are lifting puffs. In extreme conditions when a wipeout is possible, it may be wise to keep the washboards in and any cockpit windows closed to avoid a flood below. Hang on tight – it is easy to lose people overboard during a Chinese gybe. Mind your head – the boom will flip over fast. If the boat has runners the priority is to gybe the runners as soon as possible. If the spinnaker pole is set the biggest risk is the pole digging in the water and breaking or, worse still, inverting the mast. If you react fast you can save this by dumping the pole downhaul and letting the pole sky before it hits the water – do not do this until the wipe out is inevitable. Try to bear away on the new gybe by dumping the vang. If it is clearly not going to work then you will have to drop the spinnaker and unfurl the jib to bear away. This will not be a pleasant drop and you will need all hands on deck. Regain control and either tack or gybe back before rehoisting a spinnaker. Do not panic and let go of the spinnaker sheets. A smaller detail is the tweakers on the spinnaker sheets, which the crew in the image have correctly set. To maintain control, these should be tight in order to strap the spinnaker in close to the boat. If a Chinese gybe looks inevitable, ease the windward spinnaker guy. You may, however, not get much warning. 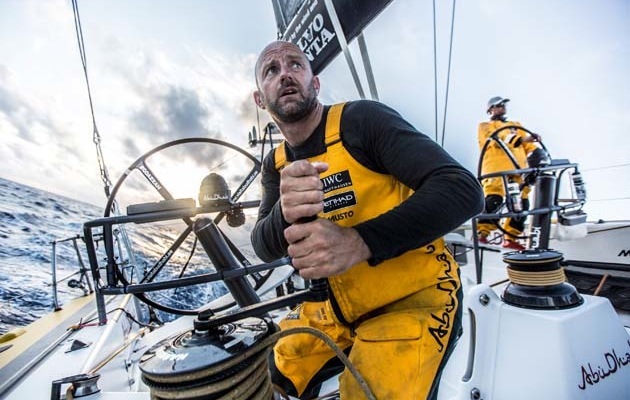 Ian Walker (45) skippered Abu Dhabi Ocean Racing to victory in the 2015 Volvo Ocean Race to become the first British skipper ever to win the event. His CV includes two Olympic Silver medals as both crew and helmsman. As well as his current work as an analyst for BT Sport’s TV coverage of the America’s Cup World Series, he plans to manage a team in the next Volvo race.